A veteran and minority owned SDB Certified Business. Get the rich color imaging of 3 panel LCD technology in an installation projector with unparalleled brightness and compatibility. The LC-XGC500 features high brightness and contrast, with a range of optional lenses, 0.8–11.3:1. It even has a simple push-button lens replacement, no dismantling required. The top access lamp and filter make maintenance easy. The lamp changer system automatically switches to a fresh lamp and the cartridge air filter system automatically advances to a fresh filter. Features a built-in 3W stereo amplifier and 2x 3.5" speakers. Mechanical shutter for true black screen. Physically centered lens. Projector supports pitch through 360°. Power Lens Shift: Up 50%, Left or Right 15%. 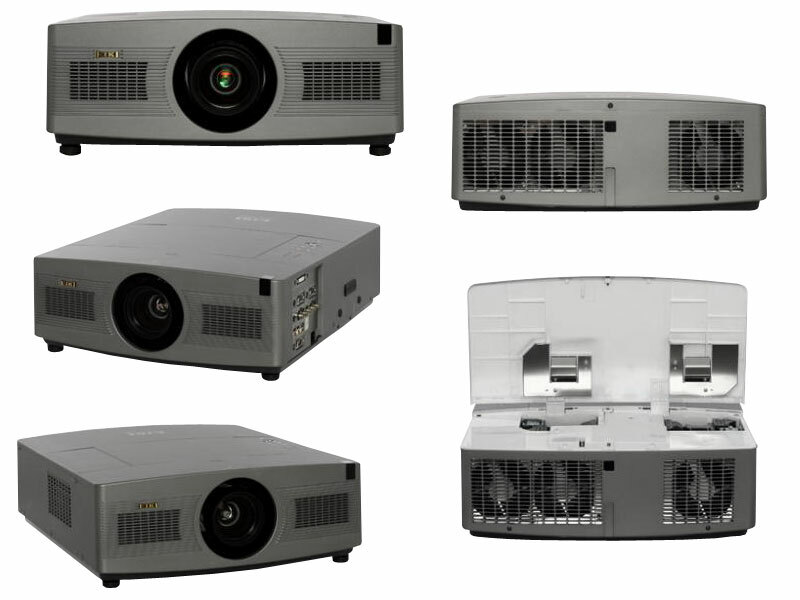 This projector has many useful functions such as lens shifting, ceiling and rear projection, perpendicular omnidirectional projection, variety of lens options, etc. The projector is equipped with 2 projection lamps and automatically switches the active lamp between 2 lamps. Use the remote control as wired and wireless, or as a PC wireless mouse. Eight remote control codes and selectable pointer shapes are also available. The projector has the Multi-scan system to conform to almost all computer output signals quickly. Supported resoultion up to WUXGA. Digital zoom function allows you to focus on the crucial information during a presentation. The security function helps you to ensure security of the projector. With the key lock function, you can lock the operation on the top control or remote control. PIN code lock functions prevents unauthorized use of the projector. Brightness of the projection lamp can be selected. The power management function reduces power consumption and maintains lamp life. Operation menu is available in 12 languages: English, German, French, Italian, Spanish, Portuguese, Dutch, Swedish, Russian, Chinese, Korean, and Japanese. Through an optional Network Manager, you can operate and control the projector. The logo function allows you to customize the screen logo. You can capture an image for the screen logo and use it for the starting-up display or between presentations. The projector has several interface terminals that can support various types of equipment and signals. 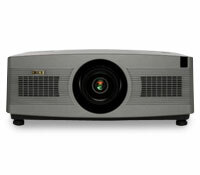 The projector is equipped with the shutter that provides complete blackness for a while the projected image is not needed with keeping the projector on. The Shutter management funtion allows you to set the timer. It prevents leaving the projector on with the shutter closed for a long time. 5000 ANSI Lumens bright at 90% uniformity and a 1100:1 contrast ratio. 3 panel LCD imaging for rich, color saturated computer and video projection. XGA resolution. Smart data compression / expansion, and video scaling. Lamp changer & cartridge air filter for mission critical/hard-to-reach installs. Includes most professional input configurations, including 5 BNC and DVI. Accepts analog and digital computer input, analog and digital w/HDCP video. Compatible with Computer sources up to UXGA, Video sources up to 1080i. Power zoom and focus. H & V Power lens shift. Digital keystone correction. Optional WideAngle and Telephoto Lenses. Instant Lens Change System. Converts interlace to progressive scan. 3-2 (and 2-2) pulldown support. Custom Warmup Screen Image Option. Built-in Color Auto Picture Control. Wireless/wired remote w/mouse and laser pointer. -50%–+700% digital zoom. Anti Keystone Power Lens Shift, Up Only 50%, ±15% left or right Cabinet Size (HxWxD) 6.89" x 17.8" x 21.7"